– Where to drain the lake. The dam to the south, where sugar farms now exist, is causing all the water to flow into the rivers. 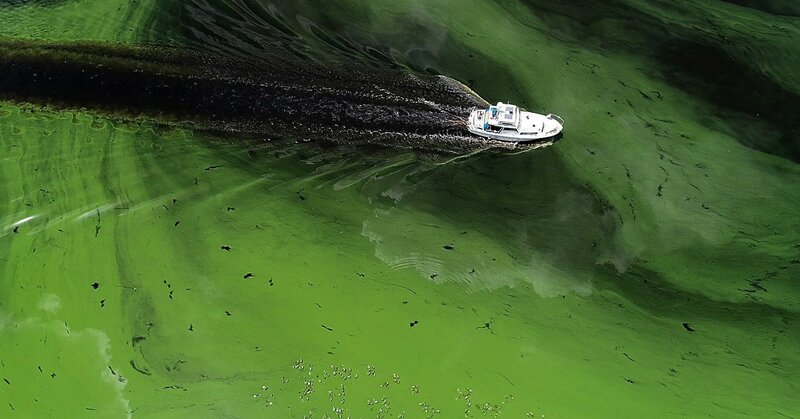 – The pollution from cow farms north of Lake Okeechobee. The cow manure, full of nitrogen, goes untreated and washes down river into the lake. -The pollution from fertilizers used on sugar crops. Most of the nitrogen from fertilizer in plant farms is absorbed by the crops. The sugar farms are also downstream from the lakes. The companies have a profit incentive to protect their fertilizers from just running off into the lake, not that it doesn’t happen during floods. Nitrogen found in manure and fertilizer feed the algae but it can also feed native plants. Buy land from cow farms north of Okeechobee and then offer subsidies for sugar farms in the south west area of Okeechobee to relocate. Then use this area of old sugar farm land to allow for spillways into the Everglades. Build a canal to take it past the residential areas. Drudge some of the land to create stormwater treatment type reservoirs. The bigger problem with the sugar farms is their location, which prevent Okeechobee from draining out into the wetlands. This plan will alleviate the volume of nitrogen added to the lake and designate an area for nitrogen infused water to feed the native Everglades instead of just feeding algae. These spillways are the most important component of solving the toxic algae problem. There is no plan that won’t be difficult and face resistance but this dilutes the burden across all the guilty parties, including the Florida citizens who’ve neglected to demand a solution. Note: Florida cow farms are not very profitable and rely heavily of government subsidies to be profitable. Reallocation of the land will save tax payers some money in the long run.